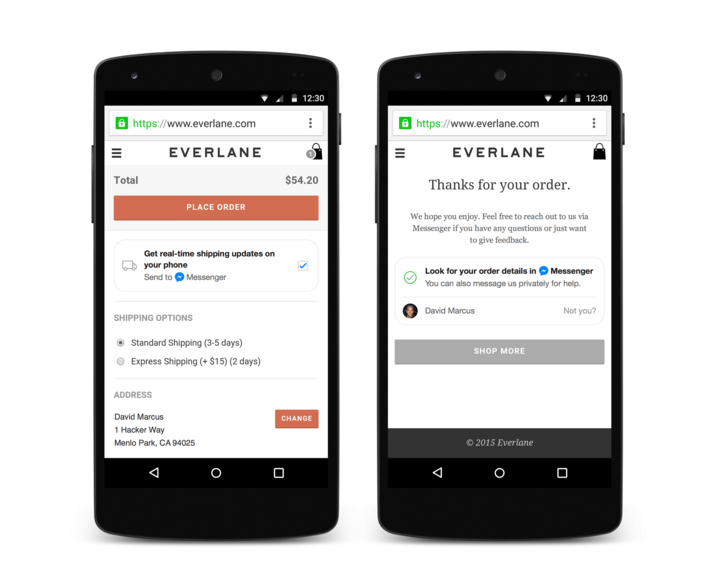 Trends 2016: Messaging as Platform - CREATIVE CONSTRUCTION - Web and Mobile.Full-Service. In 1966, a program that enabled natural language communication with a computer (chatbot) caused a sensation. The program, called ELIZA, simulated the interaction with a psychotherapist who gradually gains greater insight into the problem areas of the conversation partner by reformulating the answers of the patient. ELIZA was developed by Joseph Weizenbaum, one of the founders of artificial intelligence research at the Massachusetts Institute of Technology (MIT). With the program, Weizenbaum wanted to show the limitations of computers and to demonstrate that they would never be able to replace human beings (please also see Trend: AI-Revolution). The actual findings of this experiment, however, shocked Weizenbaum and turned him into a vocal critic of computer systems: ELIZA users sometimes conversed with the program for hours, assumed the questions they were posed had a purpose, and shared intimate personal details. The rapid advancements in the development of artificial intelligence and natural language systems during the 1950s led people to believe that computers would be able to take over all human tasks within a timeframe of just 20 years. These high expectations were not met, and the mood sobered during the 1980’s. As a result, the development of artificial intelligence and natural language systems was put on the back burner (Chatbots in customer communication, p. 25). But the last few years saw a profound shift. With Apple’s release of Siri in 2011, natural language systems are once again in the public eye (also see Trend: AI-Revolution). 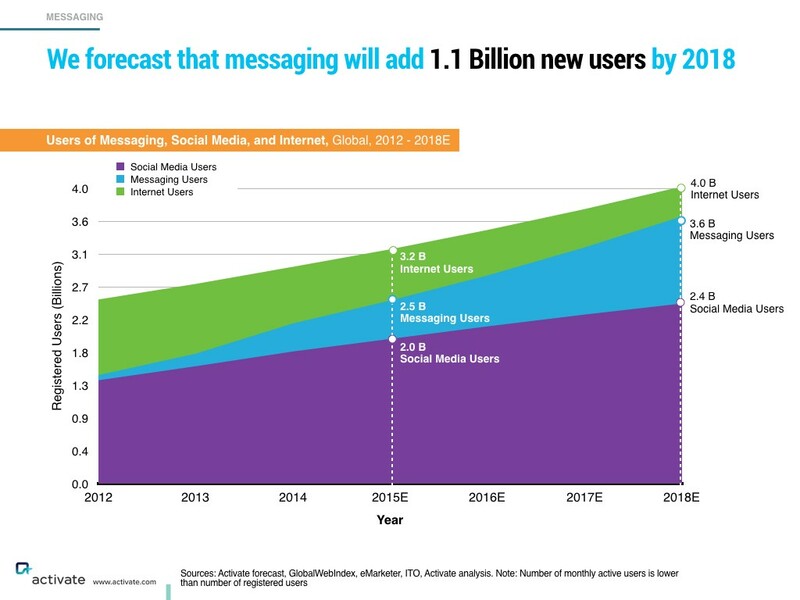 At the same time, text-based messaging systems also saw exponential growth. The first SMS transmission in 1992 ushered in a trend that took all participants by surprise: while SMS was first offered for free with every mobile phone contract, telecommunications providers soon recognized that they had overlooked a true cash cow. No one suspected that simple text messages, tediously entered with a phone key pad, would become such a popular mode of communication. Things turned out differently: in 2012, almost 60 billion SMS texts were sent in Germany alone, and with 4 billion users, SMS became the most widely distributed service in the world. Telecommunication providers quickly changed their strategy and added fees to turn SMS into a highly profitable revenue driver. The success of internet-based text messaging services like WhatsApp, which was acquired by Facebook in 2014 for the astronomical sum of USD 19 billion, almost single-handedly eliminated USD 33 billion of telcos’ SMS revenues. While the number of SMS texts sent in Germany in 2014 dropped 60 percent from its peak in 2012, texting is more popular than ever. Currently, WhatsApp alone transmits more than 30 bilLion text messages a day, which is 50 percent more than the global sms volume combined. The boom in social media boom is eclipsed only by the popularity of text messaging, which will drive 1.1 billion new users by 2018. 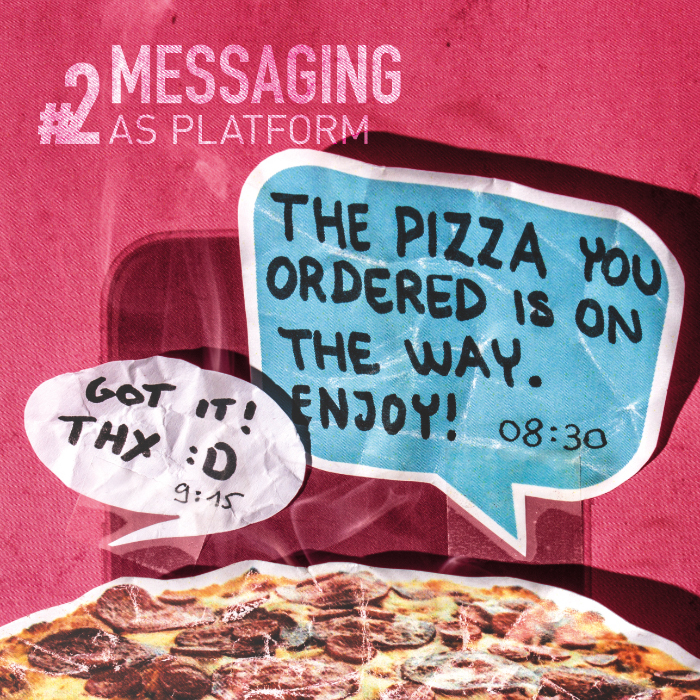 Messaging as platform: messaging apps become their own app ecosystem and establish themselves as a third runtime on the smartphone in addition to the web and apps. Messaging as user interface: interaction with the computer is increasingly message-based and takes on the characteristics of natural language communication – from graphic user interface (GUI) to conversational user interface (CUI). This is true across all age groups, and teens, who grew up with smartphones, show an even stronger preference for texting. They send an average of 60 texts a day, while the number of actual calls is declining. Texting is seen as simpler, faster, and less intrusive than calling. Without prior arrangement via email or text, a call is also increasingly deemed impolite and intrusive, as it implies that the matter of the caller is more important than whatever the person being called is currently doing. As a result, rejecting calls has become the default for many. Facebook’s record acquisition of WhatsApp for USD 19 billion demonstrated that Facebook views messaging as a key strategic pillar for its future. A quick glance at the Asian market will give you an idea of the potential of this space: Tencent has established WeChat as the dominant messenger in the Chinese market with an average revenue per user of USD 7 per year (ARPU). How can free internet-based text-messaging be so profitable, and why will this dormant trend have a huge impact on many industries? WeChat provides a development environment for its messenger, enabling external players to develop their own services within WeChat (also see Trend: API-Economy). Currently you can already transfer money, buy goods, reserve restaurant tables, or order taxis without ever having to leave your messenger or having to install separate apps (not to mention the WeChat games that still account for the majority of revenues). Taking the currently low or non-existent revenues by WhatsApp and the Facebook Messenger and their massive user numbers into consideration demonstrates this major opportunity for growth. WeChat illustrates the concept of bringing a broad spectrum of services together in a messenger. This is also the goal of Facebook, although the company realizes that the development of WeChat cannot simple be copied without adapting it to the preferences of western users. In Europe and North America, services like Uber and MyTaxi already exist as independent services outside of messengers, but in China, these services weren’t conceived separately prior to WeChat. In March, Facebook announced its messenger platform on the basis of which external applications for the messenger could be developed. Recently, Facebook also announced the integration of Uber into the Messenger. The mobile ecosystem is controlled by those who develop the operating system for the smartphone. Facebook and Amazon have missed the boat on this one since this market is dominated by Google (Android) and Apple (iOS). Facebook therefore aims to establish its messenger as a third runtime on smartphones in addition to the web and apps. The success of social apps with a valuation in the billions of dollars such as Instagram, Snapchat, and WhatsApp showed Facebook the vulnerability of its own popularity and proves how quickly user preferences can change. Facebook has tried to retain control through expensive acquisitions and generally unsuccessful attempts to copy new app sensations. With its own app store for its messengers Facebook wants to establish its own ecosystem, apart from Google and Apple, via which it can participate automatically with the app hits of tomorrow (also see Trend: Battle of Platforms). David Marcus, causing a lot of head-scratching in the industry by leaving his position as President of 50-billion-dollar PayPal to become VP of just Facebook’s Messaging Products, sees messaging as one of the greatest tech opportunities in the next 10 years. Having its own app platform is only part of Facebook’s overall strategic push, however: text messages will open the door for service communication with customers. The goal here is to establish a more efficient and natural channel for customer service than currently possible with emails: while ordering a product currently requires several separate steps, such as setting up a customer account, order and shipping confirmation, which each require a separate email, all these steps can be integrated into a single messenger dialog without ever losing the context. In addition to making the process more organized and manageable, the dialog also provides customers with a feedback channel. Traditionally this is only possible by clicking on a link in an email and reauthentication on the website. These breaks in communication represent significant hurdles, particularly in the mobile context since customers have to search for previous emails and go back and forth between applications. Currently, the customer communications of several airlines are in the process of being integrated into the messenger. KLM will be the first to start. Chat instead of additional apps? In addition to increased user friendliness in customer interaction, there is another reason why messenger-based customer service could become a relevant option for numerous companies: according to a survey of 451 companies by FollowAnalytics, 38 percent of the respondents named customer service improvements as the main reason for the development of their own app. Samir Addaine, FollowAnalytic’s CEO, observed that this applies particularly to the banking, insurance, retail, ecommerce, travel, hospitality, and automotive sectors. Given that 80 percent of the time spent by users on apps can be allocated to just three apps, it is highly unlikely to successfully become top of a customer’s mind with a separate app, especially for services that are used only rarely. In these cases, it is generally easier for the user to simply do a Google search and use the service via the web instead of looking for a separate app in the app store, installing it, getting the required approvals, and learning the new user interface of the app. Messengers, on the other hand, are already used by almost everyone, provide a familiar interface, and their dialog form is a perfect fit for customer service. Replacing inefficient email communication with aggregated threads in messengers has gained traction in other areas besides customer communication. Internal corporate communication may also be facing such a change. The most prominent example in the B2B segment is Slack, with its meteoric rise to a valuation of USD 2.8 billion. With its familiar chat interface made popular by Skype, WhatsApp, Facebook Messenger, and others in personal communication, Slack requires no learning curve. Using project-specific channels, all participants of a project can be kept up to date on the progress of a project without having to compile status report emails with long CC-lists. Co-workers new to the project can get a clear overview of the entire project process without having to dig for information in email archives. By addressing individual team members directly with @ if an answer is required from them, disrupting all other project team members can be avoided while still keeping them in the loop. Exchanging information in an informal, casual conversation style eliminates the need for formal greetings, introductions, and closings, thereby increasing the efficiency of the dialog. It doesn’t come as a surprise that The Wall Street Journal refers to it as an email killer. 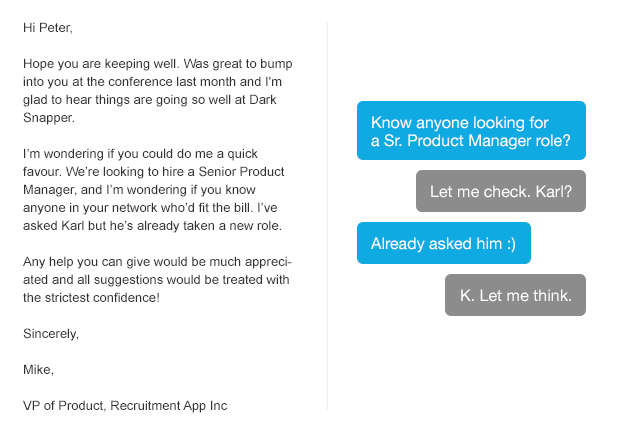 In addition to these hard criteria that other B2B messengers prior to Slack were also able to match, Slack made sure that the personality of the interface supports the informal interaction: always colorful, friendly, and with a wink, many users were instantly drawn to this messenger, and it has engendered feelings that border on affection. Using the messenger is described as fun, which is rather unusual for B2B software: it doesn’t feel like you are working, even though you are moving projects along. This can be attributed to the conversational style of the information exchange as well as the careful design of the user experience. At the same time, Slack is also promoting the development of messaging as a platform: external developers can create bots for Slack that can be accessed directly from within the chat window and execute tasks that formerly required a completely separate application. Administrative tasks such as the coordination of meetings can be directly initiated from the conversation and automated. With the introduction of its own app stores and a venture fund for Slack apps, Slack is systematically developing this platform strategy (and might be well on its way of becoming the next USD 100 billion company). The same applies to Facebook’s WhatsApp, for which developers recently created a bot that compares the location of all participants in a group conversation and then by checking the available coffee shops in the area suggests a meeting point that is easy to reach for everyone. This trend of turning messengers into platforms marks a fundamental paradigm shift: while software used to be continually expanded until it also included messaging between the users, now messengers are expanded to include software. Developers are given free rein in coming up with relevant application scenarios. In order to be considered as a software provider in this ecosystem, it is key to be accessible to outside developers via API (also see Trend: API-Economy). The goal of this evolution is not only to improve communication among people, but also to achieve interaction with a computer using natural language (also see Trend: AI-Revolution). Operating a computer used to be reserved for experts only who would enter commands for the computer to execute certain actions. This changed with the introduction of the graphic user interface (GUI), which Steve Jobs discovered at Xerox’s PARC labs and used as a foundation for the Macintosh operating system. This made the computer accessible to a broad spectrum of users. Since commands can now be carried out a by clicking on a graphic representation of it with the mouse, there is no longer a need to understand unintelligible computer code. Microsoft followed Apple’s example with Windows and the command line has receded from the memory of most users ever since. A computer is now a household item. Against this backdrop, it has almost been forgotten that the most natural form of interaction for people is still language and that even the graphic user interface is an adaptation to the needs of the computer. In an effort to hide this condition, a lot of resources are being spent on making applications as intuitive and user friendly as possible. In reality though, it often takes a lot of intermediary steps to reach the desired goal. In working with popular office software, everyone has experienced the tedious retrieval of functions hidden in menus and submenus. Booking a flight takes 18 steps on 10 different screens on which you have to navigate through a maze of entry fields, drop-down boxes, and selection fields. Mobile devices have intensified this problem only further: since the screen is only a fraction of the size of a desktop, screens must be greatly reduced in complexity in order to be usable. To be successful, a clear focus becomes even more important in mobile apps than on the desktop: they have to do only one thing and do it well. This has led to even the most granular use case having its own app – even if it is just ordering cookies. Whatever activity comes to mind: there’s an app for that! The driver approaches the car. The driver reaches for the smartphone. The driver turns on the smartphone. The driver moves the slider to log into the smartphone. The driver enters the security code. The driver scrolls through the available apps to find the app that will open the car. The driver taps the icon of the appropriate app. The driver waits for the app to load. The driver looks at the app and tries to figure out how to work it. The driver guesses which icon in the menu will open the car. The driver selects this icon to open the car. The driver opens the door. A total of 13 steps were required to reach the desired goal, and all but two involved operating an interface developed for this purpose. Is this really an improvement over simply opening the car door with a key just because now there is an app for that? An ideal user experience should not contain any of these steps. Computers should be able to execute the required steps to fulfill user intentions on their own and hide the complexities involved from the user. User Interfaces (UIs), and particularly graphic user interfaces (GUIs) are only required as long as computers cannot understand us directly without having to adapt our interaction to their requirements. Therefore, the interface is not the product, but only the scaffolding that allows us to interact with the product. The goal therefore has to be the design of an optimal user experience, not an optimal screen. The best interface thus is no interface. In the last year, several startups have adopted this mantra and are heralded in the media as “the next big thing”: they do not require learning an app-specific user interface, nor do they require that users change apps for every little requirement. The user states a request via text message to a given phone number. The startup answers like a concierge without limitation to a specific domain of knowledge. Various tasks ranging from finding an appropriate restaurant for a romantic dinner to making a reservation, ordering and sending flowers, booking a flight – even the delivery of a tiger – are handled via a chat interface in natural language that every user is familiar with. The graphic user interface (GUI) is replaced by the conversational user interface (CUI). 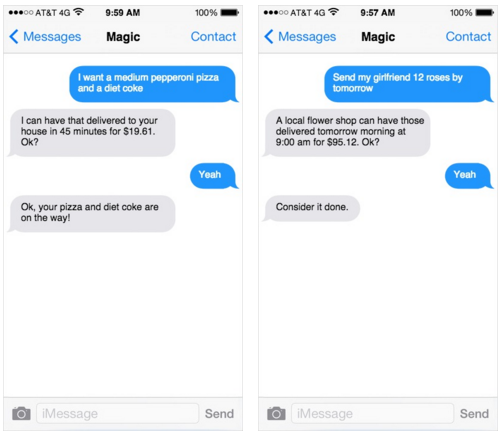 Magic, Operator, and GoButler are probably the most prominent players in a long list of a new category that is referred to as Conversational Commerce. Whether these apps can also be successful from a business point of view will depend on the scalability of the model. So far, it can be assumed as pretty low, since the incoming requests are still primarily being processed by humans. Simply shifting the cognitive load from the user to the provider makes these models appear rather capital intensive. Building up an extensive database with a wide range of requests and solutions along the way could enable computers to gradually take on more and more requests without requiring human intervention. This goal is also pursued by Facebook. With the announcement of expanding its messenger with “M”, Facebook has entered conversational commerce with a concierge functionality. With the acquisition of Wit.ai earlier on, Facebook established the foundation for making natural language text conversation intelligible for computers (also see Trend: AI-Revolution). This conversion of natural language is the basis of Facebook “M” and allows messaging to become the user interface in the communication with computers. To ensure quality and develop the system further, the computer is also supported by real people who expand the capability of the system with every dialog. Additionally, Facebook offers the use of Wit.ai to external developers via an API, enabling them build their own conversational interfaces (also see Trend: API-Economy). Google is therefore planning a repositioning of its messenger products and the integration of chatbots that, in turn, can be provided by external developers. In addition to reducing the cognitive load of the GUI, a CUI also offers new use cases of addressing hypothetical, future scenarios, for which there is no graphic representation: simply by saying “transfer € 500 to my savings account as soon as my paycheck is received“ a user could initiate a future transaction that is tied to a condition. In conjunction with last year’s Trend „Pro-active Experiences“, it becomes apparent, how the cognitive load of a user can be reduced significantly, if such a CUI in response to a command like “book a table at Borchardt for Bill, John and me an hour after my last meeting“, can initiate all the required steps itself: accessing the calendar, identifying the last meeting and its duration, understanding the number of dinner guests, accessing the restaurant reservation system and booking a table for three, and accessing my contacts to send an invitation to Bill and John. Currently, each one of these steps requires using a separate GUI with its own information architecture that has to be learned by the user. To make these interactions possible, the various applications (calendar, contact list, restaurant reservation system) have to be able to communicate with one another. What this means for companies is that, in the future, they will not be part of the conversation and their services will not be relevant if they do not make them available for others through interfaces (APIs) (also see Trend: API-Economy). Whether Facebook will be successful in establishing its Messenger as a third runtime on the smartphone in addition to the web and apps remains to be seen. 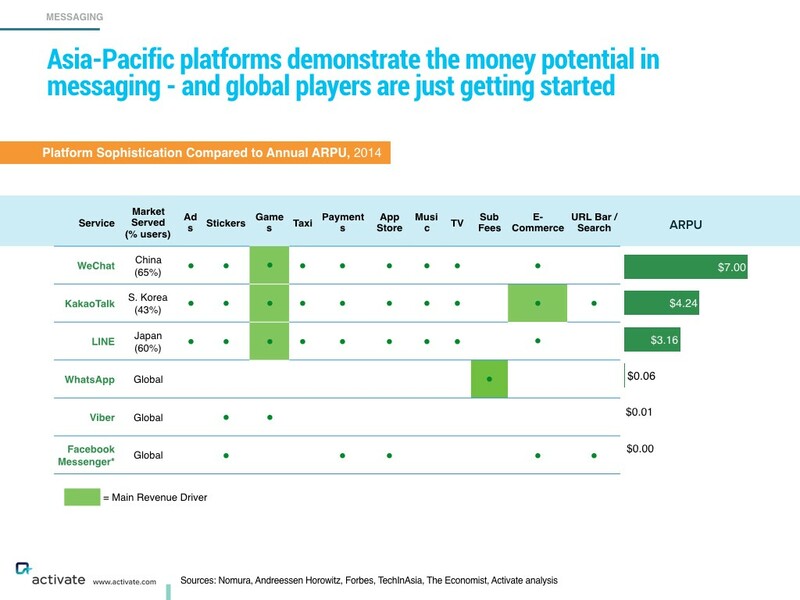 In the light of the strategic significance for its power struggle with the operating system providers, Google (Android) and Apple (iOS), the popularity of messaging with every smartphone owner, the positioning of not just one but two dominant messengers, Facebook Messenger (western world) and WhatsApp (developing countries), and its resolve in spending unparalleled sums, the starting position looks bright for Facebook. Google won’t give up this space to Facebook without a fight, since a messenger combined with chatbots could threaten its position as the gateway to the web via search. The threat of this trend for its ecosystem and its own messenger iMessage won’t have escaped the attention of Apple either, which is pursuing its developments with the usual level of secrecy. For companies, this means that in addition to a web and app strategy, they must also think about a messenger strategy going forward, or rather make it a part of their overall integrated digital strategy. 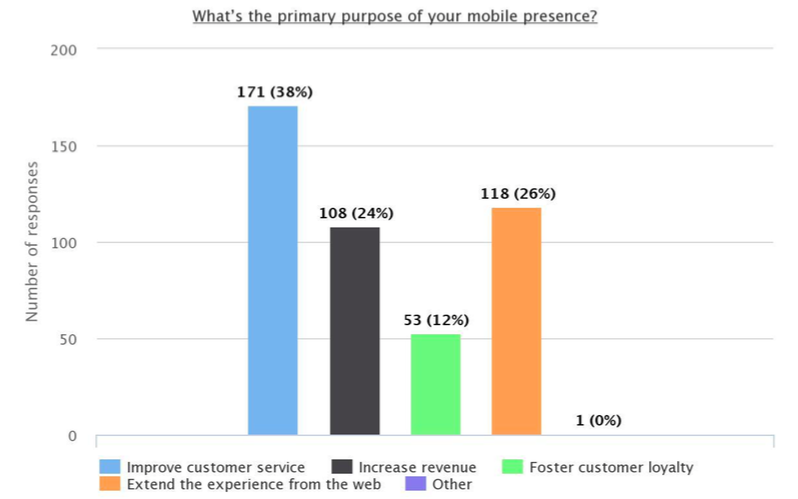 Since improving customer service is consistently mentioned as the main reason for the development of own apps, but 80 percent of the time a user spends on apps is allocated to just three apps, messengers gain specific relevance in this context: they rank number one in usage and their dialog form is ideal for direct communication with customers.